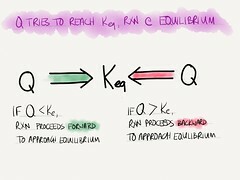 a) Keq = ([N2][O2])/[NO]2 → don’t forget to use the quantity in the exponent! a) Note that dissociation is not equivalent to solubility!! 1. Solubility product constant (Ksp) – the extent at which a salt will dissolve in water (is just another equilibrium constant) → solution is saturated!